What brought me the three-and-a-half hours up Interstate 71, a trip that I confess I nearly never take? The opening night of the Cleveland International Film Festival, where "California Typewriter" was the featured film. Readers of this blog are probably aware of the film. In case you're not, here is a trailer that features my manifesto (though I am not the focus of the movie). Obviously, being the opening-night film was quite an honor. The pre-film party was held in a beautiful Art Deco ballroom, where movie-reel-themed table decorations presided over sushi and canapés. Here I am with director Doug Nichol; Ken Alexander of Berkeley typewriter shop California Typewriter; Toronto typewriter collector Martin Howard; and artist Jeremy Mayer, who turns typewriter parts into amazing sculptures. 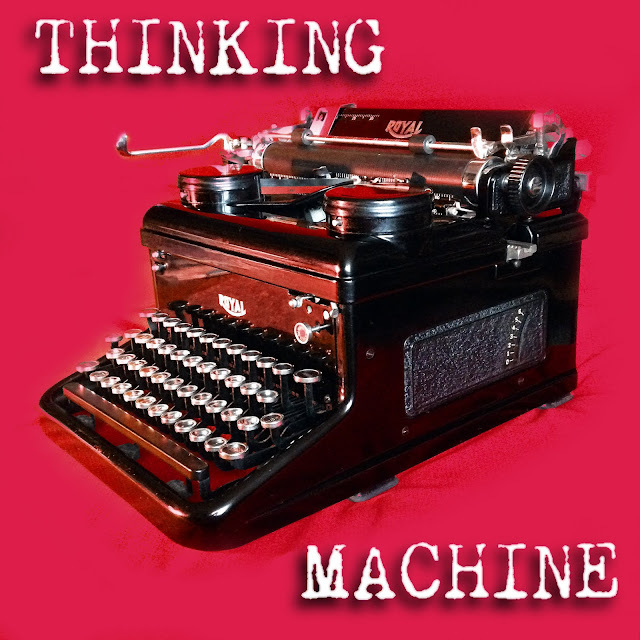 The film tells the stories of Ken, Martin, and Jeremy, interspersed with interviews with Tom Hanks, Sam Shepard, and others (including me), with many fascinating insights into the meaning, history, and potential of typewriters. It was my first time seeing the completed film, and I found it delightful and uplifting. The film showed simultaneously in seven well-filled theaters in a cineplex. At the party afterwards, audience members were enthusiastic. Ken was a particular focus of attention. Martin was invited to "type" on this dress decorated with typewriter keys. 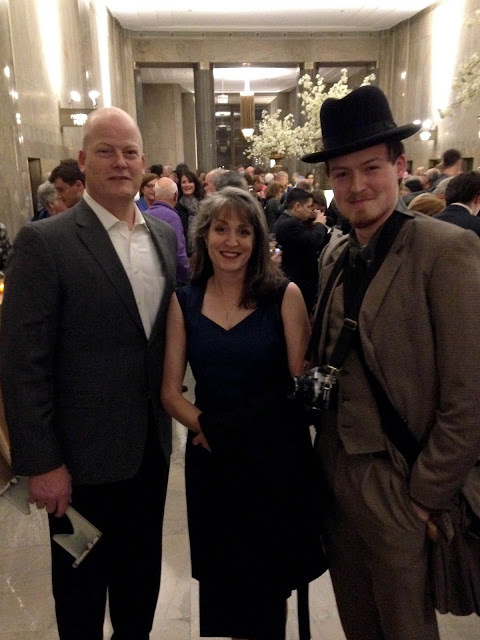 Brian, Kim, and Ian Brumfield of Brumfield & Sons Typewriters attended the film and the party afterwards. Looking sharp! Naturally, after the film everyone wanted to get their hands on a typewriter. The festival organizers made it possible, with several machines on which people were invited to write "love letters" to the festival. It was great to see people lining up get their turn. I'm glad to report that the film recently secured an excellent distribution deal. It will be coming to theaters, and will eventually enjoy streaming and other forms of distribution. So you will get a chance to see it before long! Should you buy a Royal Epoch? Medium answer: The Epoch is a recently manufactured manual portable typewriter that you can currently (March 2017) find for sale, new, from around $150 to $250. That is viewed as an expensive price by most buyers, yet assembly of a manual typewriter is a complex and labor-intensive process, so the profit margin for the manufacturer is necessarily small. The Chinese factory must be trying hard, too hard, to maximize that margin, because quality control is just not there. If you are lucky and get an Epoch that is basically in good shape, and if you are mechanically handy in case something needs fixing, then this model is not a bad choice if newness is important to you. 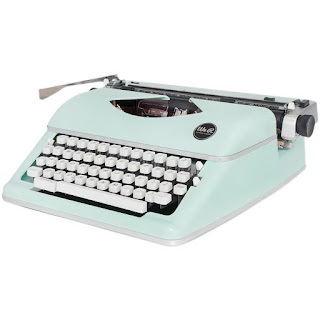 It has a lot of features, and it will type, but it isn't very precise or durable. If you don't care about getting a new machine and just want quality, a well-preserved typewriter made in the 1950s or 1960s is likely to be better. 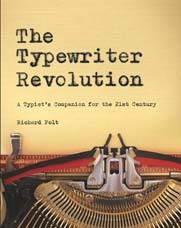 I offer many suggestions in my book The Typewriter Revolution. 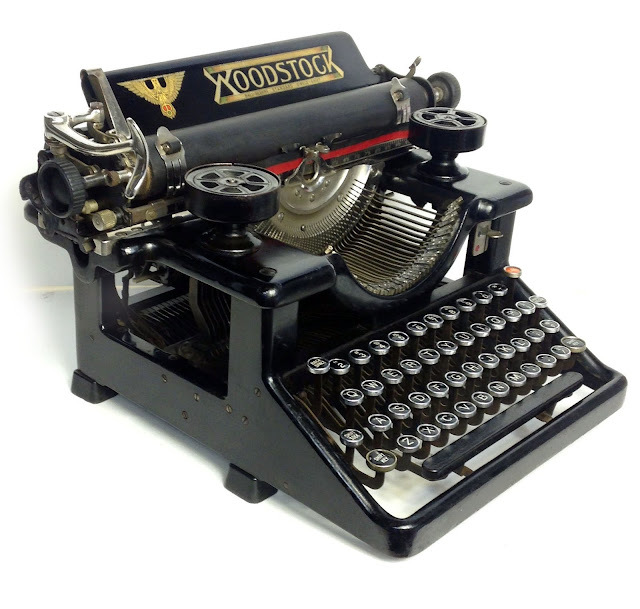 The angled "wedge" shape is reminiscent of some electronic typewriters, while the black color is more typical of classic prewar machines. The back panel of the carriage is metal, by the way, but all other parts of the shell are plastic. Yes, it's a good piece of industrial design, visually speaking. These machines are made by Shanghai Weilv Mechanism Co., which may be the last manual typewriter factory in the world. According to Will Davis, this design is "derived from the old Olympia Carina series, which originally were Nakajimas from Japan." I believe he's right (compare this Carina 2). Shanghai Weilv has also produced typewriters with different mechanisms, such as the Royal Scrittore II, which I review here. The Scrittore is a smaller, carriage-shifted machine. I pulled off the slug, but I have not learned how to resolder slugs properly. So for now, this tool can imprint words from books of Gadsby's ilk only—a limitation making composition difficult and grammar awkward. 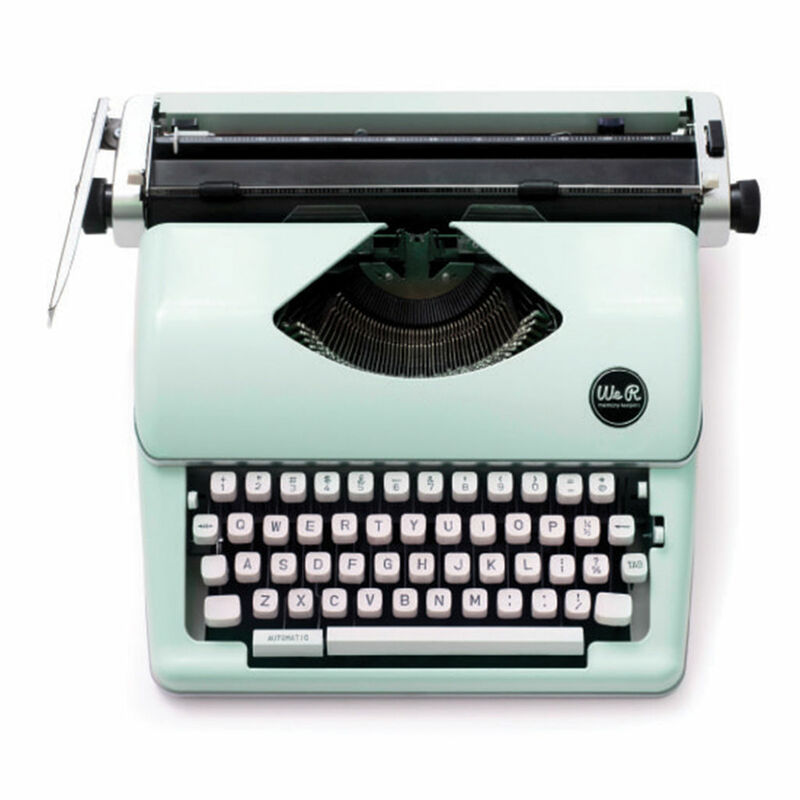 The typewriter has many features, including keyboard-set tabulator with tabulator brake, tension adjuster, automatic spacer, basket shift, paper rest, variable spacer, line finder, and 44-key keyboard (in a slightly unconventional version of QWERTY). I can report that the space bar, automatic spacer, and tabulator all work very smoothly and feel good. But there are some disadvantages to the design. There is a carriage release button only on the right, the high tension on the mainspring makes for a stiff carriage return, and the short levers on the top row of keys create an awkward motion. Everything possible is made of plastic, such as most of the ribbon mechanism. Even the slotted segment for the typebars is plastic. The margin release mechanism was disconnected and had to be squeezed back into place. A set of tab stops on the left were missing, and one was inserted wrong. The margin release would not clear the left margin stop, which also had to be formed. The left paper guide was misaligned and had to be adjusted (it is shown readjusted below). By the way, the platen on this machine does not feel rubbery; it is almost as hard as the plastic body, and I have no idea of its chemical composition. Finally, this set of springs for the tab stops was found rattling around loose inside the typewriter. This shoddy manufacturing is frustrating. As I said above, it takes many hours of labor to create a manual typewriter. Evidently the factory is trying to produce them as quickly and cheaply as possible in order to make the most money, but wouldn't it be more prudent to invest a little more in better materials and quality control? The machine should never have left the factory with problems like this. One seller of the Epoch warns buyers that it is "simple, basic" and "not in any way" like an electric or electronic typewriter. This vendor suggests that it can be used for filling out forms, labels, and envelopes, amusing children, or sitting on a shelf as a conversation piece. No refunds! The twenty-first century deserves better. If the Epoch were built with more quality and care—and, no doubt, sold at a higher price—it could be an impressive machine. When will someone take the plunge and create an excellent manual typewriter for our age? They say they can make machines that can think. I'd rather have a machine to think with. When I saw an early Woodstock on eBay, with a well-preserved decal, for a very low Buy It Now price—$25!—how could I resist? 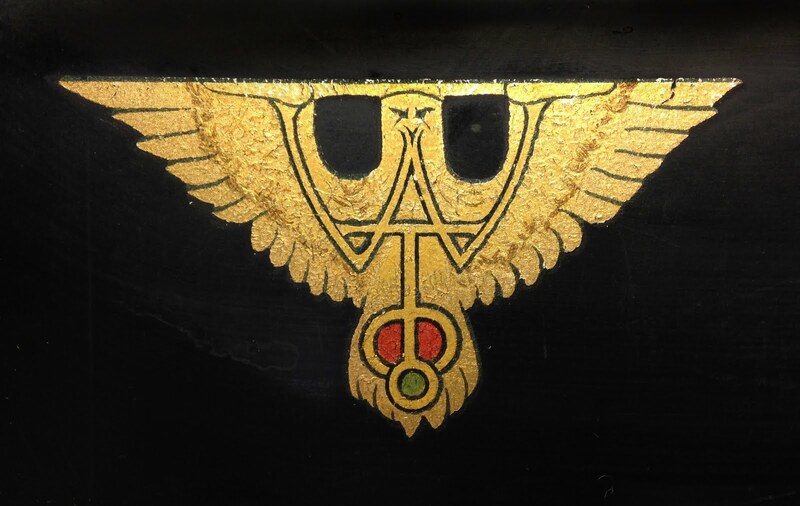 The decals on these early machines have a lot of color and charm, including the eagle (?) 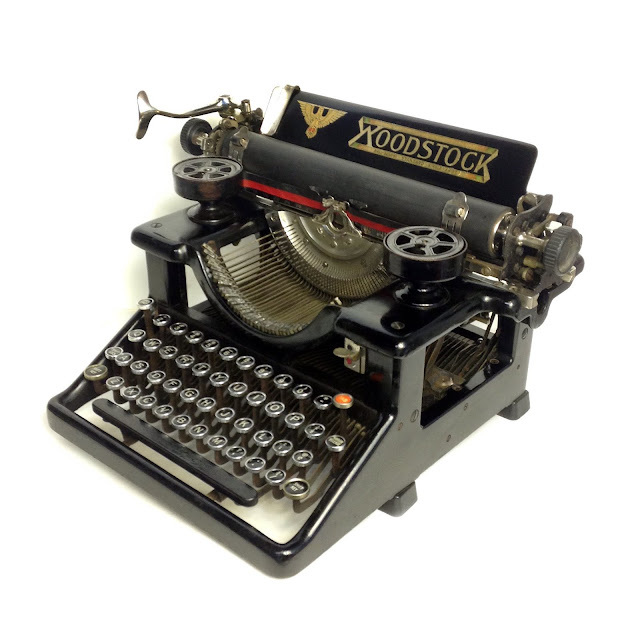 that incorporates the letters WTCo for Woodstock Typewriter Company. 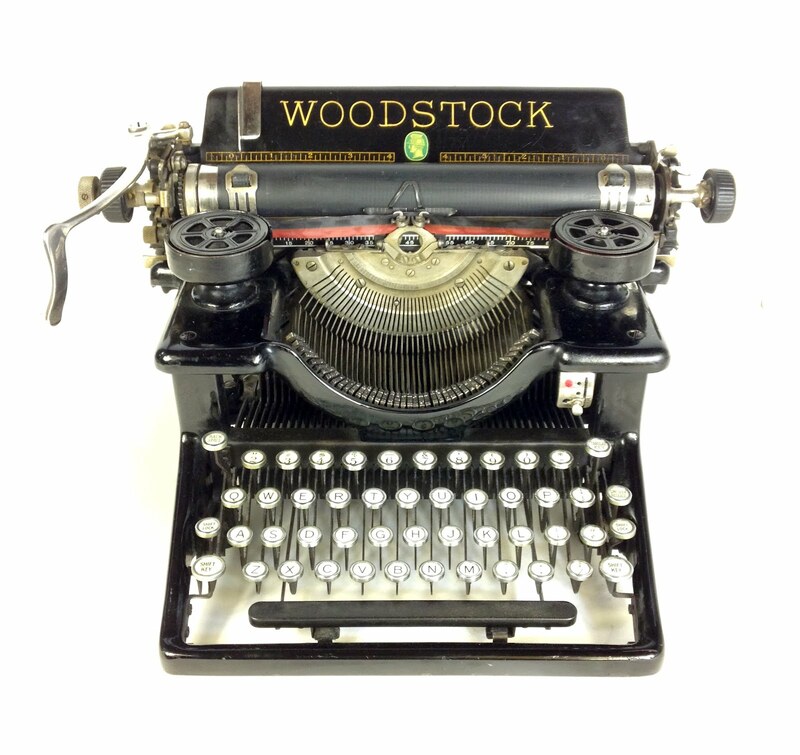 Later Woodstocks, such as this 1930 machine, switched to a simpler decal and an illustration of the head of Mercury. My guess is that DW55398 is the original serial number. 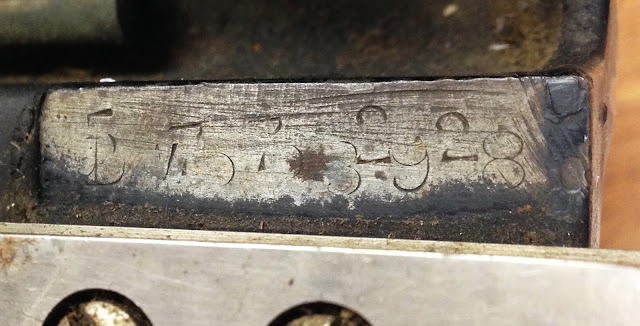 It was then filed off from the body of the machine—but not completely—and the number 57722 was stamped imperfectly over it. Why? The DW prefix stands for dead key, wide carriage, according to our serial number information. This is certainly a wide-carriage machine, with a platen length of 11 inches, but it does not have a dead key (used for typing accents and other punctuation marks). Maybe the typewriter was originally destined to have a foreign-language keyboard, but then someone at the factory thought better of it. Both serial numbers should date from 1920. There are many small differences between this early Woodstock and later ones. For instance, there is no stencil setting, and the ribbon control gives you many tiny increments between the upper and lower halves of the ribbon. This would actually be great if you're using a one-color ribbon and want to squeeze the most ink possible out of it. The escapement is also different. It feels a little stiffer to me than the later design, and is fairly loud and rattly when you return the carriage. After extensive cleaning and polishing, the machine looks great.